Everybody tells us to say no. No to drug, no to bad relationships. No to temptations, to evil, to sin, to distractions. 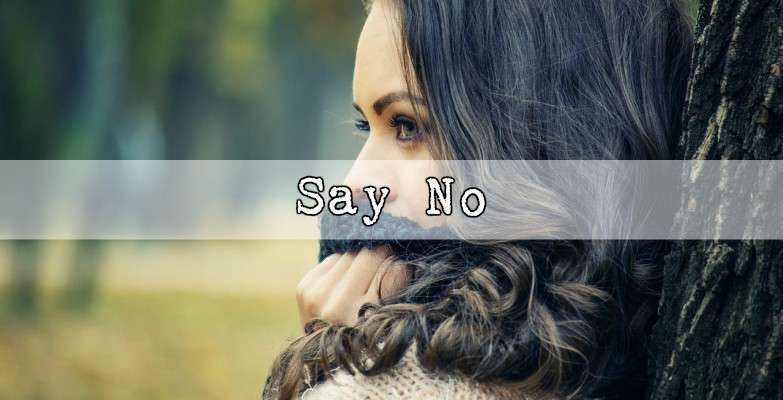 Say no to extra responsibilities you don’t have time for, and actions you will regret. I’m here to encourage you to say no as well. But for a different reason. Something a lot of people over look. Say no to pain, prejudice, people who mock you. But most of all say no to people who hurt and try to change you. You are who you are. The only Person you ever need to be concerned about pleasing and gaining approval from is Jesus. If someone tells you you’re not good enough, don’t let that change beautiful you. If someone challenges you, insults you, because of your lack of cranial knowledge, muscle power, or wits, don’t let that shape who you are. You cannot please people. You never will. Because they are human, and you are human. Sometimes rejection isn’t visible, it’s a slight turn of the head in a conversation, an averting of the eyes, a polite closure, so they don’t have to talk to you. Words like that cut right to the heart, no matter what show you put on, no matter how much you tell yourself you really don’t care all that much. Say no to those thought, those questions. No no no. You do not need to impress those people. Do not let them define you. Jesus defines you. He is the guideline, the perfection you strive for. Only Jesus can give you the approval you seek in your heart. You did nothing wrong. You made no mistake that turned them off. You were you. Just because they didn’t love you that way doesn’t mean you need to change. Jesus made you perfect, He loves your wit, your gift of leadership or your ability to follow. He gave you the gift of comforting others, having fun, being you. So be you. Be exactly who He made you to be. Don’t let your thoughts/their words/the devil discourage you, pain you, tell you you’re a failure or a mistake. Don’t give them that power. You are perfect in Christ. Seek Jesus, seek to become like Him, and the cares of the world will fade. That’s so so true!! Thanks for speaking right to my heart.